This is Philippe ARLAUD's production of a whimsical love story. It is Jacques OFFENBACH's sole opera, best known for its "Belle nuit, ô nuit d'amour" ("Beauteous Night, O Night of Love"), other highlights including the "Chanson de Kleinzach" ("Song of little Zaches") sung by Hoffman, and that ultimate showcase of coloratura soprano singing, the "Les oiseaux dans la charmille" ("The birds in the arbour") aria sung by Olympia. This is ARLAUD's 2003 production at the New National Theatre Tokyo. He brings added depth to the work with radiating wit and humour, as well as effective use of fluorescent colours, bringing out the sense of fantasy of the work. Sébastien ROULAND, the conductor, appears at the New National Theatre Tokyo, for the first time. This eminent Offenbach scholar brings his interpretations of French music. Hoffman is played by Dmitri KORCHAK, who enjoyed critical acclaim in 2016 in "Werther", making another appearance here in French opera, in which he excels. Lena BELKINA, a star of bel canto, plays Nicklausse, La Muse. The four villainous roles of Lindorf, Coppélius, Dr. Miracle and Dapertutto are played by Tomasz KONIECZNY, a consummate actor with a reputation as such, who sings dramatic bass baritone in Wagnerian works and appears for the first time at the New National Theatre Tokyo. Tickets are sold via the website of PIA Corporation. from 10:00 am to 11:00 am on the day of the performance. 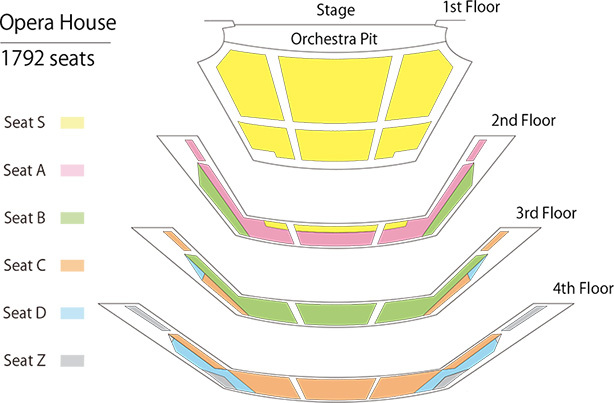 Z seats are available online from 10:00 am to 11:00 am on the day of the performance. One ticket per person.